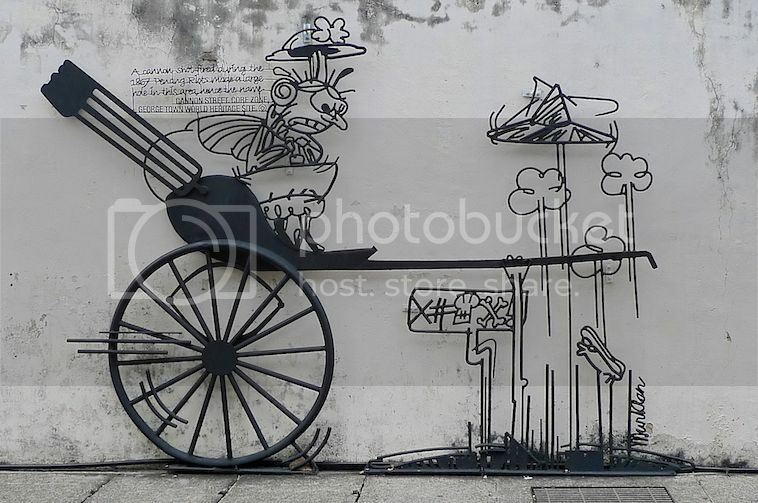 Besides the murals, there is another type of street art in Penang known as steel rod sculptures. 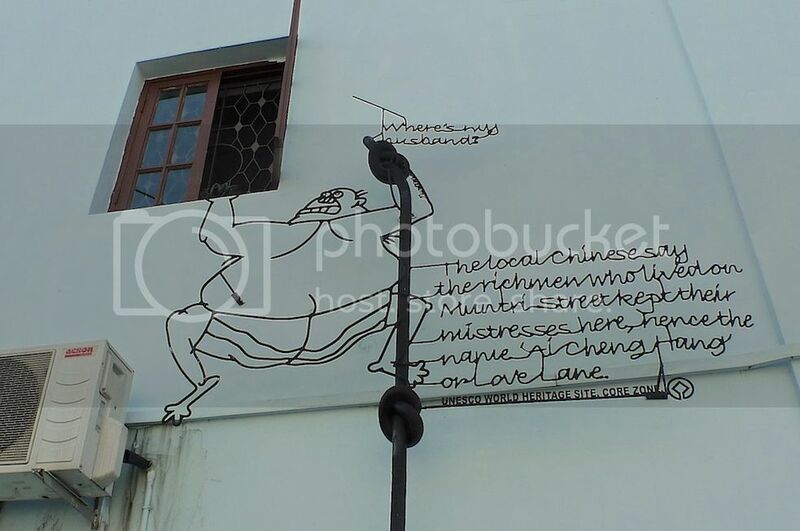 During my 4-day trip in Penang last year, I managed to capture some photos of the murals and the steel rod sculptures in George Town. Read about the murals in my previous post. The steel rod sculptures are really a collection of caricatures by local cartoonists depicting the history of the streets where they are located. I guess it's more fun to learn about the history of George Town in this way. However, the hole was said to be not on the ground, but on the wall of the minaret of Acheen Street Mosque (Masjid Lebuh Acheh)! 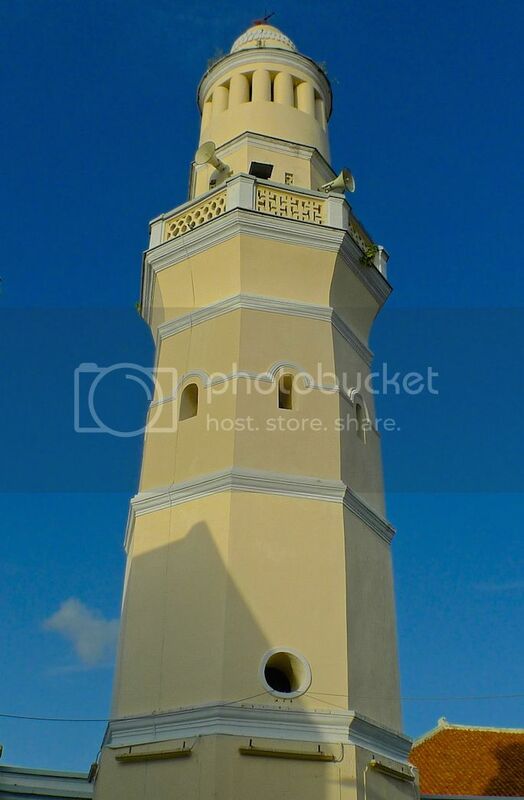 I managed to take a photo of the said mosque. Can you see the hole? I saw this on the wall of Yeoh Kongsi along Chulia Street Ghaut. Based on the caricature of cartoonist Baba Chuah, it depicts a group of newly arrived immigrants received by their host. 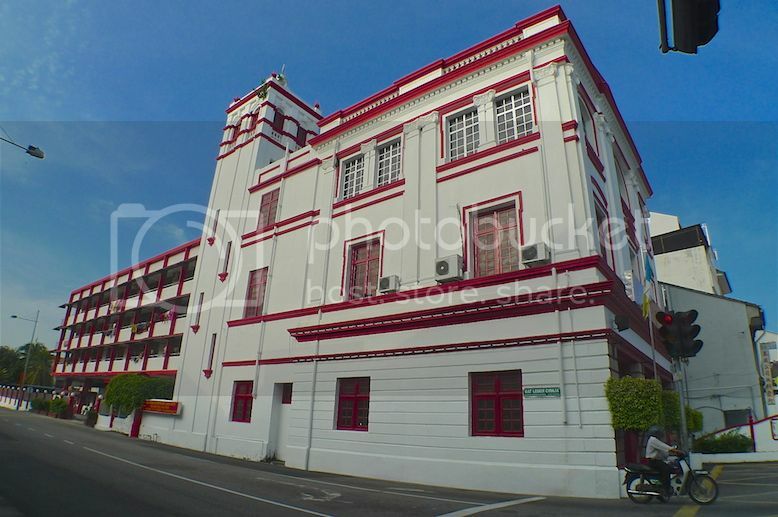 The Yeoh Kongsi was established in 1836 to look after the welfare of the newly arrived Yeoh clansmen. Did you know that up till the year 1909, the police in George Town also doubled up as fire fighters? 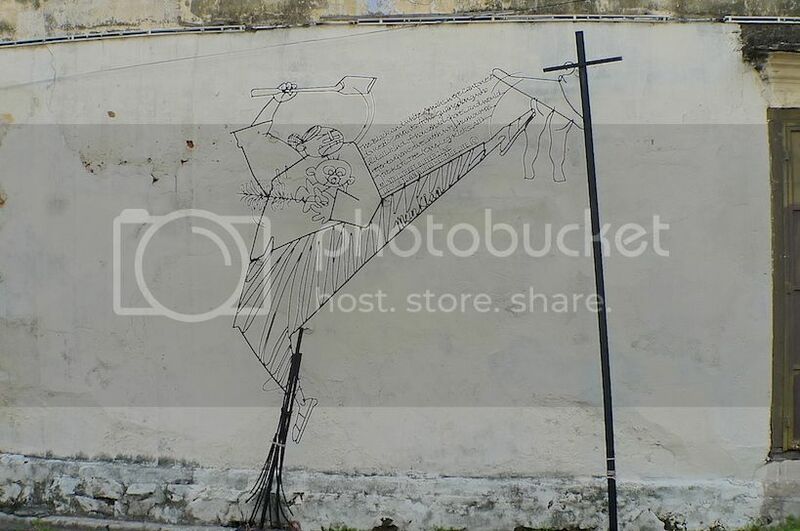 This was clearly depicted in this steel rod sculpture on a wall along Chulia Street Ghaut. 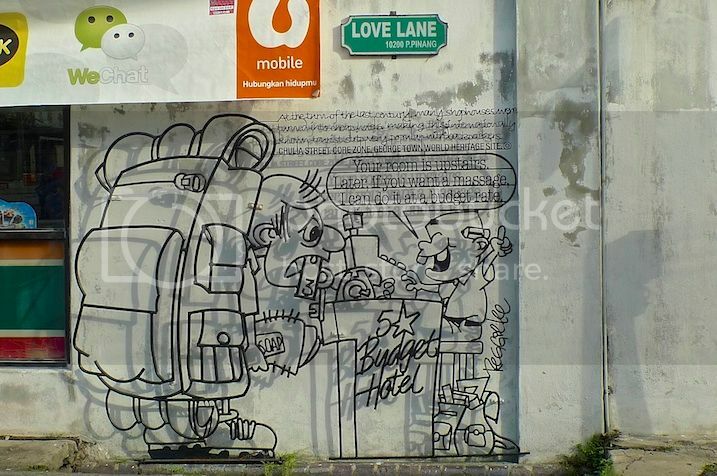 There are many shophouses turned budget hotels at Love Lane and this is celebrated with this steel rod sculpture on a wall along Love Lane. Based on a caricature by cartoonist Reggie Lee, it depicts a rather comical budget hotel scene. My photo is not very clear, so in case you can't read what the cashier said to the tourist, well this is what he said : "Your room is upstairs. Later, if you want a massage, I can do it at budget rate." LOL! There's another steel rod sculpture along Love Lane which seems to describe this street pretty well. Based on the caricature by cartoonist Tang Mun Kian, it depicts a man climbing down the wall from a window apparently to escape from a raid. It is widely believed that in those days, rich men who lived at nearby Muntri Street kept their mistresses in the houses at Love Lane. On a wall facing Muntri Street, I saw this 'one leg kicks all' steel rod sculpture based on another caricature by cartoonist Tang Mun Kian. It celebrates the amah or Chinese housemaids. These amahs, which came from Guangdong Province in China, did almost everything in the household, from cleaning to cooking to taking care of the children, hence they are known as 'yat keok thek' which in Cantonese means 'one leg kicks all'. 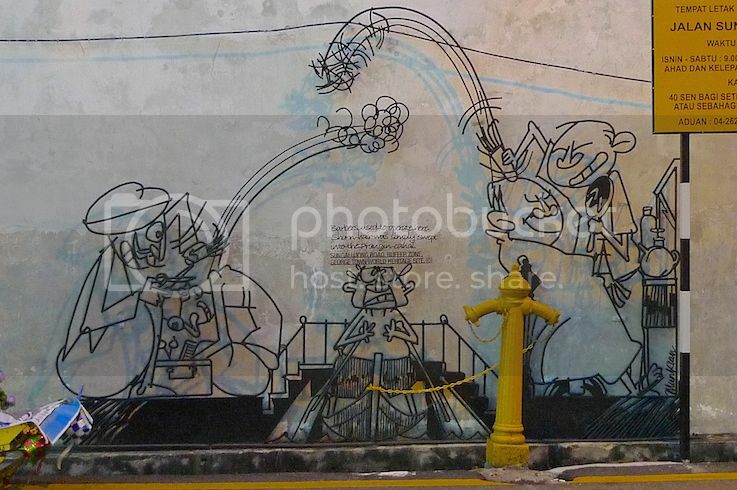 This steel rod sculpture at Sungai Ujong Road depicts two barbers on opposite sides of the then Prangin canal throwing locks of cut hair into the canal, to the bewilderment of a boatman passing through. Based on yet another caricature by cartoonist Tang Mun Kian, the sculpture celebrates the barbers who lined up on both side of the canal to ply their trade in those days. There were many more steel rod sculptures which I have missed or did not take photos of because it was too dark by then, but if you are interested, the complete list can be found at Timothy Tye's Penang Travel Tips website. 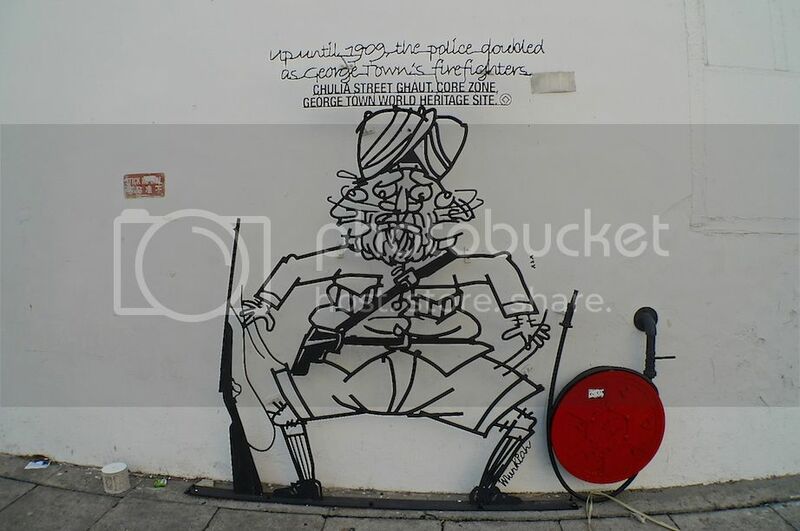 I still prefer murals compared to these steel rod sculptures but the latter do provide some comic relief during my walk around the streets of George Town.